Bike Storage Shed free plan. 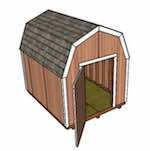 Build this 10 x 14 shed with side porch using these free woodworking plans. Be sure to follow through to part 2 and part 3. Use these free plans to build a small 8 x 10 foot shed. Be sure to follow through to part 2 and 3 at the bottom of the page. Build this 10 x 16 foot lean to shed using these free woodworking plans.